Michelin is in the final phase of a new tire development. In a press release publicized this afternoon, the Clermontoise company officially announces the Pro 3 range. Since December 2006, 1.000.000 kilometers of test have been performed by the professionnal riders from Bouygues Télécom, AG2R Pro Tour teams and several amateur racers. 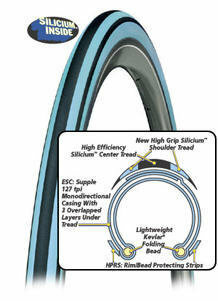 The Pro 3 Race, best tire of the new range will be marketed from March 2008. The official presentation will take place during the Eurobike that we will cover of course. Officially, the Tour de France 2007 serves as ultimate test for these clinchers. In view of the tires used by AG2R team, the Pro 3 race looks a lot like the Pro 2 Grip. The protypes are re-badged naturally! 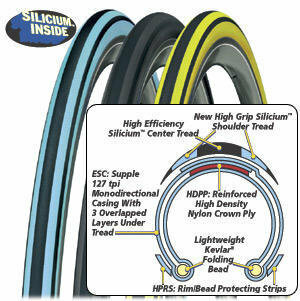 Michelin Pro 2 Light and Pro 2 Race drawings. They will pass on soon. Cette entrée a été publiée dans Nouveautés. Vous pouvez la mettre en favoris avec ce permalien.